Gyoza originated in China and is a popular side dish in ramen shops and tapas-style restaurants called ‘izakaya’. It is served with a dipping sauce made of equal amounts of soy sauce and rice vinegar with a few drops of sesame chilli oil. You can make these dumplings using different fillings such as minced pork, prawns or vegetables only. I usually make a large batch and freeze them and this chicken gyoza recipe cooks really well from frozen. Remember to steam cook the dumplings for longer if you’re cooking them from frozen. 1. Mix together all the ingredients for the gyoza filling in a large bowl and set aside. 2. Before you start making the dumplings, place the gyoza skins, a clean bowl of water, a teaspoon and a large serving dish on the countertop. 3. 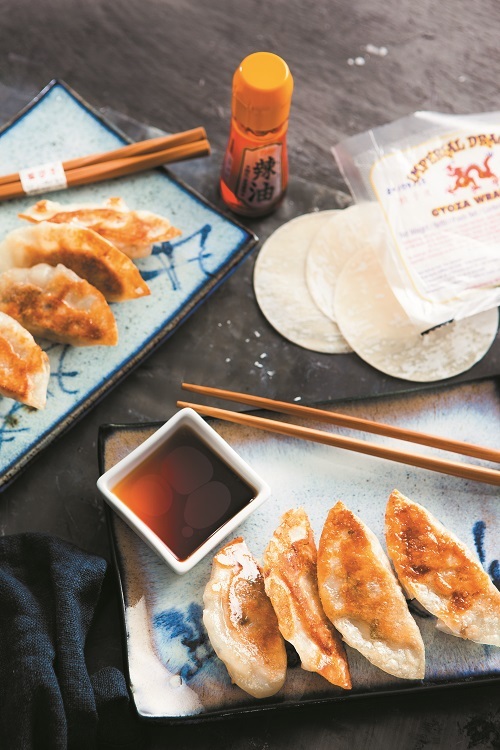 Place a gyoza skin on the palm of your hand, take a heaped teaspoon of the filling and place it in the centre of the gyoza skin (see a–b). 4. Moisten the edge of the upper half of the gyoza skin by dipping your finger in the bowl of water and sliding it along the edge (see c). 5. Fold the bottom half of the gyoza skin over the filling so that it meets the moistened upper half (see d). 6. Start to pleat by folding the edges (make one pleat in the middle and two pleats at either side) (see e). 7. Press firmly on all pleats to ensure that the ingredients are secure within the gyoza skin (see f). 8. Heat the oil in a non-stick frying pan over a medium to high heat. 9. Place the gyoza in the pan and fry until the base is slightly golden. 10. Pour 80ml of cold water around the edges of the pan and cover with a lid. Leave steaming for 10 minutes or until almost all of the water has evaporated. 11. Remove the lid and continue to fry until the water is fully absorbed. 12. Finally, drizzle the sesame oil over the gyoza and fry until the base of the gyoza is golden brown. Transfer to a serving dish. 13. Mix all the ingredients for the dipping sauce in a small bowl and serve with the gyoza. Fiona Uyema spent three years in Japan, where she learned about Japanese food. She has appeared on TV and featured in many publications, including the Irish Independent, The Irish Times, EasyFood magazine, FOOD&WINE and the RTÉ Guide. 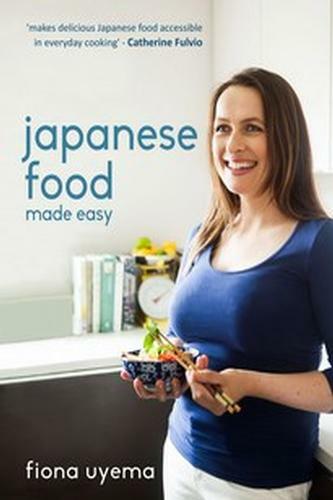 In her cookbook ‘Japanese Food Made Easy’ Fiona shares her love of Japanese cooking, known for its health benefits and carefully balanced flavours. Using local ingredients where possible, she demonstrates how easy it is to cook Japanese food at home without spending hours preparing complicated dishes.